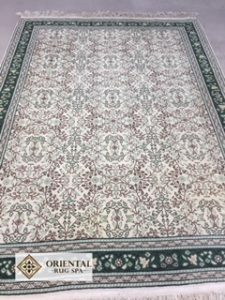 Oriental Rug Spa offer a specialist Persian, Oriental and Contemporary rug cleaning in Frimley Green. We also offer a rug repair service. If you own a dirty or soiled rug that needs professional cleaning, then why not give us a call on 01276 423150. You can drop the rug into our wash facility or arrange a time for us to collect from you. Tunisian rugs have an oriental design influence as well as more local, regional and traditional styles. They tend to be woven with a wool pile and a wool foundation. Many Tunisian rugs use thick, deep piled wool with geometric shapes and patterns displayed throughout the piece. The main colours used tend to be different shades of grey, brown and black. Tunisian rugs are woven by woven and are produced mainly with a deep pile but sometimes also a flatwoven pile. One of the most common types of Tunisian rug is the Berber which is woven using thick, deep piled wool. The weavers use the wool from their sheep and goats and these rugs are used to provide warmth whilst migrating through the cool heights of the Atlas Mountains.